Melt butter,add garlic and spring onions. Cook for one minute. Add white wine and cream. Bring to the boil and cook rapidly for 3-4 minutes. Add arrowroot. Bring back to the boil, add lemon juice,salt, cracked pepper and smoked salmon. 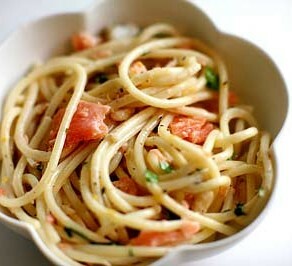 Cook Pasta in boiling salted water, drain and transfer into large serving bowl. Pour over sauce and sprinkle with freshly chopped dill.